« A Chalk Painted What??? After much tie reading, you seem to be the only person who has tried all three various methods. Your time and effort will save me time and money, after much reading I shall try the calcium carbonate method. Your ime and effort is most appreciated. 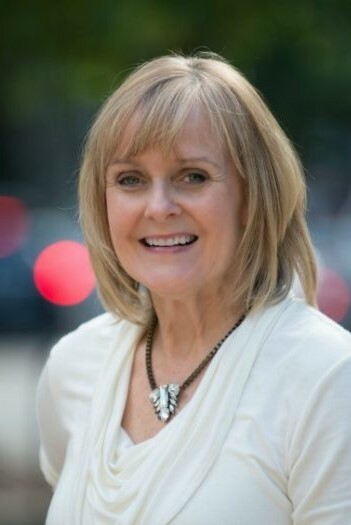 Exactly thank you Patty ! I have an entire bedroom suite I want to paint (I need to do it on a budget!) and have been looking for this exact information! Thank you for your review! This is perfect! I love the carved detailing of the furniture but the color of wood is kind of yucky and it’s definitely used (and free!). I am new to redoing furniture this way. Do you have any posts about the wax process? Is it necessary or optional? I tried the calcium carbonate recipe. I bought a sample pot of Valspar paint (less than $3) and mixed it with the calcium carbonate with a small bit of water. This worked well. I was able to do (2 coats each) the drawers of a 10 drawer dresser, an older cabinet, 2 jewelry boxes,some odds and ends and still have paint left over. With the smaller sample pot/s I can try so many colors and do many projects with just a little money! Thanks for the recipe. I also waxed afterward, just as if I had used ASCP. This by far, is my favorite recipe. Hi, Patricia! Just happened to find you on Pinterest because this is what I have been looking for–a comparison of all the recipes, and I couldn’t find it anywhere but here 🙂 I was thinking I was going to have to waste my time and do the comparison myself. WHEW! Glad you did it 🙂 Thanks for the info! Thank you for testing out all 3 recipes. I have been using plaster of paris and I also got the recipe from Elizabeth & Co. But I do notice it has a grit to it that I have to always sand off to be smooth. When I run out of the giant box of plaster of paris, I am going to give the calcium carbonate a try. You will love the CC Susan. Thank you for stopping by and for leaving a comment. P.
You’re welcome Camille. I understand about staying in budget and I hope you’ll enjoy using this recipe! Have fun painting. You are so welcome. I enjoy sharing the “how to’s” of the projects I tackle. Like many of your other fans, I am grateful for your review of all three recipes and including tips, cost, etc. I had just bought plaster of paris to give it a try. So thankful!!! I am wondering about the wax that you use. What kind? Where can I buy it? I have never tried ASCP, because it is out of my budget, but would love to try the calcium carbonate recipe. Thank you for this post! I like the ASCP Soft Wax the best. However, you can also use MinWax Polycrylic wipe on or brush on for a really hard finish. Hi. I am new to this and was wondering what finish is the latex paint? (flat, egg shell, etc..) Thanks you. Very informative, Great Article. Thanks! Think it’s unanimous you’re trying out all 3 recipes is a winner that has helped all of us to save time and money. Your experience is a life saver. I too went on the hunt for the calcium carbonate with no luck. I don’t have a fancy phone so could you please supply the source you found? 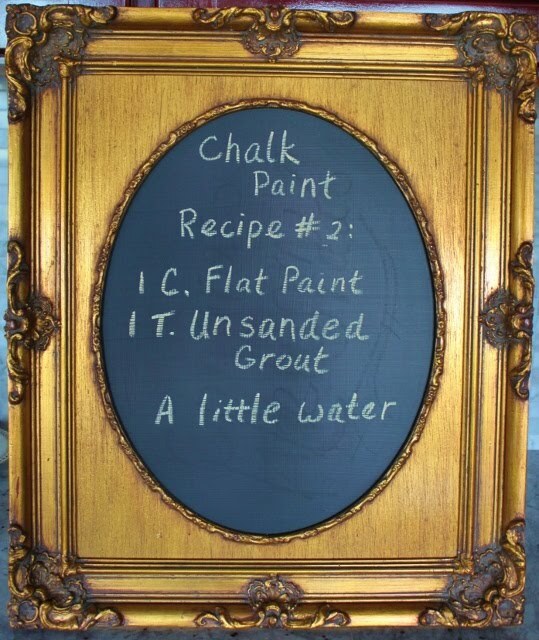 I have some unsanded grout I used cause that’s all I had when I wanted to make some chalk paint,(we live out a few miles from a store I could buy things like that from). I’m afraid the commercial chalk paints like Annie Sloan are just not in my budget at any time so the home made chalk paint will have to do me. I also want to paint my kitchen cupboards which are just the type with the vinyl wood look,double yuk. I’ve wanted to paint them since we moved in here (almost 7 yrs now) but the thought of having to prepare them has stymied my efforts. I’d love to take the doors off or at least cut the center panels out to put chicken wire or fabric instead. Altho they’re not great cupboards there are several of them, hence my hesitation, just overwhelmed me at the thought of tackling the job. Sorry for telling you more than you likely wanted to have to read. What type of wax did you use? Where did you get it? Can you use oil based paint to mix with the calcium carbonate? Where can I purchase calcium carbonate? Thanks! I am curious about this as well! I’d like to try oil based paint since it is supposed to hold up better on cabinets. I tried Rustoleum flat black oil based paint with plaster of paris today. I am currently waiting for it to dry it seems to be ok.
How did that end up working? I have some leftover cabinet paint that I’d like to use on a side table, but can’t find any recipes using oil based paint. Thanks for your help. There are so many recipes out there, so I’m glad that you personally tried these methods and could compare them. I’m now on the hunt for calcium carbonate where I live! I live in New Zealand and searched for calcium carbonate everywhere, turns out it is also used in the garden: its called Garden Lime, Go figure! I found it on Amazon so next is to try it out. Can you tell me how much calcium carbonate to use to 1 cup of paint? I have seen several recipes that say 2 Tbsps, but that isn’t 1/3. I wanted to have a better understanding of how much to add. Thanks so much. In answer to your question Brook . . . 2 parts paint to 1 part calcium carbonate is a 2 to 1 ratio, so if you’re using 1 C. of paint you would use 1/2 C. calcium carbonate. You can thank my scientist hubby for coming up with that as I’m more creative than mathematical. I always just use 2/3 C. paint and 1/3 C. calcium carbonate to make it easier on my brain! Thank you SO very much for this post and for taking the time to do this comparison! 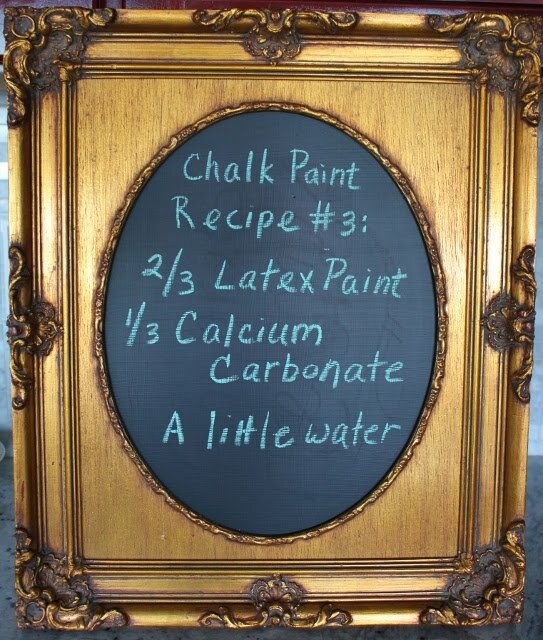 I just ordered my calcium carbonate, and I can’t wait to test out my homemade chalk paint this week. Your tips are greatly appreciated! this is an awesome post, and I am so glad I found it, so thank you! I just went yesterday and bought plaster of paris, because I tried the unsanded grout and didn’t like it ). But I have to tell you something funny – during sewing, I notice that white chalk worked really well in drawing a cutting line on dark fabric, so I sharpened my chalk with my eyeliner pencil sharpener, for a sharper line… I wonder if all that powder that comes off when I sharpen the chalk would = Calcium Carbonate powder? I think I might try it = FREE ( maybe I should drink it for my bones, too!) can I ask one more question? I saw your comments above about waxing – I have the ASCP soft wax, but WHEN do you do the buffing? do you let the second coat dry overnight then buff? and also – have you tried any other (cheaper) waxes? ok, that was 2 questions, sorry. Again, THANK YOU so much for sharing this post! your blog is awesome! Hi! Thanks for posting these wonderful reviews. Jut wondering — still no need to sand or prime with these recipes? FYI – all — I am redoing 2 vintage coffee tables. I did sand the tops because they were in poor shape. But even after 3 coats, the stain was still bleeding through. SO I have primed over my ascp, and am going to try a 4th coat. I found this disturbing since ASCP states no sanding/priming necessary. I did a chair – no sanding at all – and had no problems. 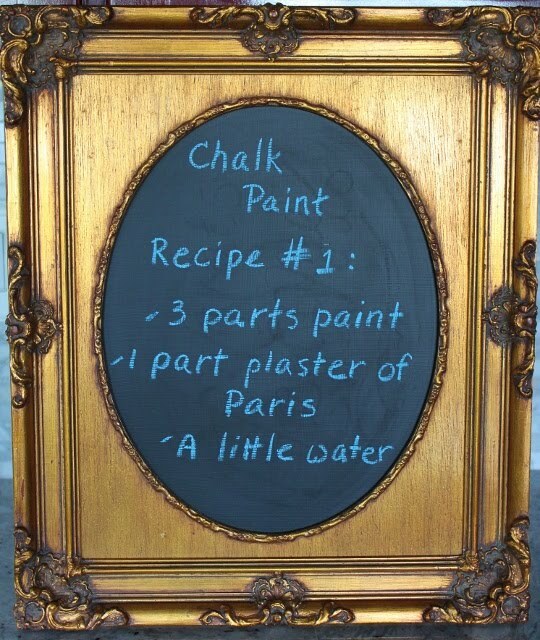 Any advice to these scenarios in using the homemade chalk paints? Calcium carbonate (also called whiting) is available at ceramic supply shops. I got a pound for under $2 and 5 lb. is $7.50. I’ll have to check that out. I buy the food grade CC because it is ground super fine and dissolves in liquid. It will be interesting to see if whiting is the same consistency. Thanks for the tip! 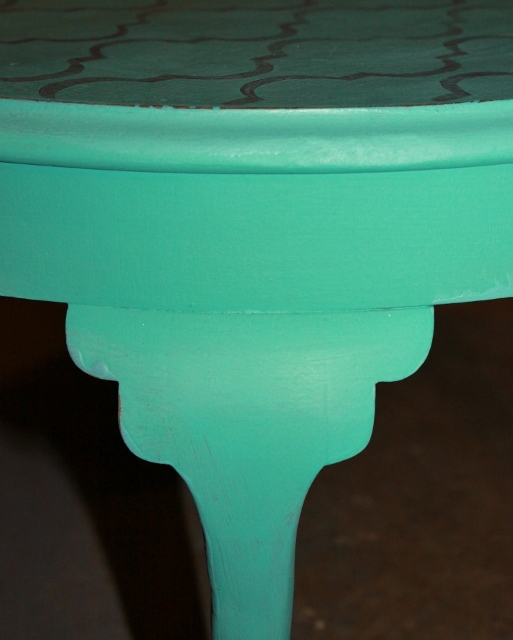 Taking the leap today on my first piece (thrift shop end table w/beautiful details) using the CC recipe! Although I did buy ASCP Old White, I’m going home made first, in turquoise and using min wax. I want to try both alternatives before investing in more ASCP. Although, I have to admit I did buy one of her brushes too! Wish me luck! Thank you for this post. I have a question about the paint you used/ You said flat paint but samples that come from LOWES are all satin will that change anything?? I have bought the unsanded grout because CC is now where I live!! Hi Shannon – Satin paint will work just fine. Looks like I need to go back and amend my post. Since writing it I’ve used all kinds of paint (except gloss and high gloss) with no problem at all. Have fun! 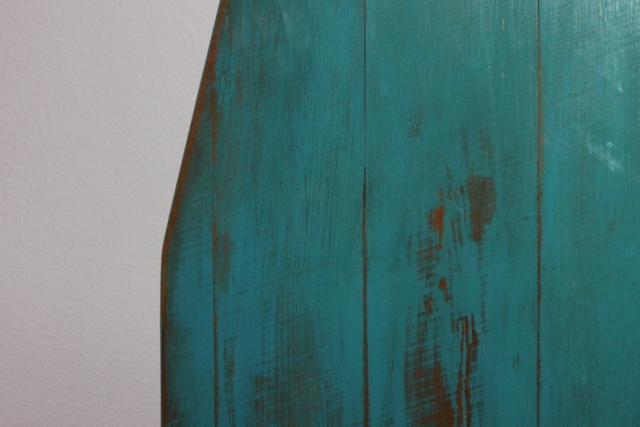 Have you tried oil based paint? I have a ton of Satin Paint sitting in my garage…have you tried #3 with satin paint or just flat? Hello! Just a little tip I read on Salvaged Inspiration. Someone wrote in under her post about the best chalk paint recipe that you can purchase Reptile Calcium Carbonate from any pet store that sells reptiles…I guess like PetsMart or Petco…if you ever need some and are in a jam. From the ingredients, it’s the same stuff as the food grade. I like your blog. Its a very nice information. Great Blog. Thanks for all your experiments. 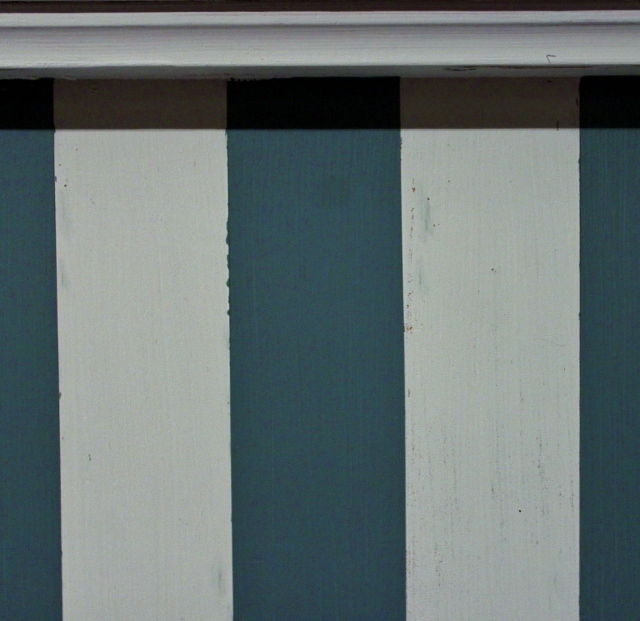 I am working on my kitchen cabinets and have been mixing sample paint with CC and POP. I put two coats on and then seal with Mniwax Polycrylic. Wonder if the difference will show if I do the upper cabinets with a mix of paint and CC only. I love this paint because it is soooo easy. I have painted kitchen cabinets before and it was a real chore. Clean, sand, prime, sand, paint, sand, etc. You get the picture. With this mixture clean and paint and seal no problem. The lower cabinets are coming out wonderful. Have already painted my bathroom cabinet and love it. How did you measure the paint and the calcium chloride? was it a 2/3 pint of paint to 2/3 pint of the calcium chloride? did you do it by weight instead? Patti, I am the customer service manager for a small mfg company (work from home) and we mfg paintbrushes. I had a customer call the other day about brushes and she had just chalkpainted a COUCH. Here is her recipe: 1/2 gallon latex paint from Walmart; 1 cup baking soda; 1 cup water. Mix well, paint.